Is Your Garage Door Frozen Shut? Fix That With These Tips. Even in Middle Tennessee, the weather can change dramatically at the drop of a dime. During the winter months, it is possible for your garage door to completely freeze to the ground. This will make it difficult to open and shut your door. If mistakenly left open all night during freezing temperatures, your garage door can even freeze while in the open position. When you need to get your garage door unstuck or unfrozen, use these tips from Superior Overhead Doors. Even though you may think your garage door is completely frozen, the problem may actually lie within the parts. Sometimes customers call about a frozen garage door only to find out that their springs and other garage door parts have been rusted over or damaged. Before completing any of the following steps, thoroughly inspect your garage door to ensure that all parts are operational and in good condition. Usually, a red cord will be hanging from your operator rail. Refer to your owner’s manual and disconnect the operator. By disconnecting your garage door operator, you are ensuring that your operator will not continue to try and open your garage door, thus causing more damage. Go around to the front of your garage door and see if there is an abundance of ice. If this proves to be true, try to chip the ice away from the base of the garage door. Do not try to melt the ice with boiling water. It will just freeze again and you’re back to step one! Once you’ve gotten rid of the ice, do your best to lift open the garage door. Still not working? Move on to the next step! If you’ve tried everything and your garage door still will not open, contact the team of garage door technicians at Superior Overhead Doors as soon as possible. We’ll make sure your door is not damaged and becomes unstuck! Did you know that your garage door is one of the largest and weakest entrances to your home? If you do not properly secure your garage door when a severe weather threat is issued, you could put your home and your family in grave danger. During a storm, especially in Middle Tennessee, a variety of components can harm your home, garage door, and potentially even your family. Strong winds, including tornadoes, can cause significant damage to a home. If you have an old garage door or did not properly secure it prior to the storm, there is a possibility of your garage door being completely destroyed. Depending on the strength of the wind, the sturdiness and strength of your garage door, and the structure of your home, there is also the chance that your home could partially collapse if the garage door is completely blown out. Contact the professionals at Superior Overhead Doors in Murfreesboro, TN to discuss your concerns and the state of your garage door during a storm. Powerful storms can uproot trees, bushes and even carry cars and other objects for lengthy distances. It is entirely possible that flying debris such as branches can be launched into your garage door, therefore damaging the overall structure. If you are concerned about trees, branches, and other objects harming your garage door during a storm, call a garage door specialist to voice your concerns and receive proper instruction. 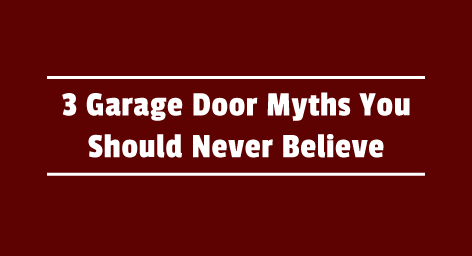 Is Your Garage Door Damaged? In the case that your garage door did receive minor or major damage during a rainstorm, tornado or other type of storm, it is crucial that you begin the remodeling process or installation process immediately. If you wait to long, you are jeopardizing the overall integrity of your door and potentially compromising the safety of your family with a wide-open entrance to your home. When a natural disaster such as a storm occurs and your garage door is damaged, call the professional team of garage door specialists at Superior Overhead Doors. 4 Signs that your garage door is telling you it needs to be repaired. Has your garage door been acting funky lately? If so, it’s probably trying to tell you that something is wrong. You’ve tried replacing the battery in your garage door opener and using it a bit closer to the garage, and yet the door still acts up or does not work properly. Well my friend, your door is probably trying to tell you that it’s time for some repairs. Check out these easily recognizable signs that your garage door needs to be repaired. 1. It won’t close or open. This is the most blatant sign that your garage door needs to be inspected and repaired as soon as possible. The root of the problem could be caused by a variety of reasons – faulty wiring, misaligned sensors and more. Before you call a professional garage door repair service, be sure to double check that nothing is in the way of the sensors or blocking the door. Sometimes if a box or item is in the way of the sensors, your door will not open. However, if your door is clear of obstructions and still won’t open, be sure to call your garage door repair technician pronto! If your door is visibly off its tracks, it can cause your door to malfunction and become stuck. This tends to happen to old garage doors or doors that have sustained damage over the years. There is not much that you can do from home to alleviate this situation, as it may require specific parts and other necessary equipment. When this occurs, your best bet is to call an expert garage door technician. When your garage door seems to be taking its sweet time opening and closing, there may be a problem. If you notice any delays, hiccups, or your garage door seems to be opening and closing slower than usual, your best bet is to contact a professional. When this sort of malfunction happens to your door, there could be any number of problems occurring. Save yourself the money and let an expert take care of a slow garage door. Do you know how long your garage door has been in use? If it has been on your home or building for quite some time, and has encountered a bit of damage over the years, it could need to be repaired simply for old age. Just like any other machine, over time the effectiveness and performance of the machine begins to decline. A garage door repair technician can assess your situation and help you whether or not you should repair or replace your old garage door. For the most part, unless you have extensive garage door repair training, it is difficult to fix garage doors on your own. If your garage door is exhibiting any of these signs, it means that it’s time for you to call your local garage door company and schedule a consultation appointment. Superior Overhead Doors can help you with all of your garage door needs. Give us a call at 615-867-1163 when your garage door begins to act up. Top 4 Reasons to Replace or Repair your Garage Door Today. If your business uses a garage door of some sort, whether for storage, distribution, or to let customers in, when is the last time you replaced or repaired it? Is it dirty, cracked, and really old? If so, it’s time to replace your commercial garage door. Believe it or not, replacing your business’s garage door will reward you with numerous benefits. Increase the value of your property. Aside from improving the aesthetic quality of your store, the overall value of your property will increase. Adding a brand new commercial garage door will tell future investors or property owners that they won’t have to spend additional capital on replacing a worn out door. In fact, it may even be the convincing factor of their purchase. Plus, a new garage door will make your commercial store front stand out and pleasing to the eye. Enhanced security. Chances are that you have valuable products and monetary assets inside your business. A broken garage door makes it incredibly simple for intruders to enter your business and gain access to whatever may be in plain sight. Malfunctioning garage openers, cracks in the door, and other disruptions are open invitations to not only burglars, but also to unwanted wild animals who will find a way to enter your store. Enhanced security doesn’t stop at thwarting unwanted visitors. Strong and sturdy new commercial garage doors will ensure that all of nature’s elements stays outside where it belongs. You’ll never have to worry about leaves, snow or rain entering your business. Reduce your business costs. With a new commercial garage door, you can eliminate or reduce a variety of regular costs for a business. A new garage door will thoroughly keep in all heat and cool air, meaning that your monthly energy bill will decrease. No longer will you have to constantly worry about heat or cool air escaping due to a faulty garage door. Furthermore, certain types of commercial garage doors, such as metal, require very little repair or maintenance, once again reducing your overall costs. Insurance benefits. Many insurance companies actually take all of these benefits into consideration when you replace your company’s garage door. You may qualify for lower payments simply by replacing your commercial business garage door! By putting off a garage door repair or keeping your old garage door, your business could be at risk. From rising costs to the threat of theft, your business could fall victim to a variety of unpleasant occurrences, all because of an old commercial garage door. Does this hit home? Secure your business by investing in a new commercial garage door from Superior Overhead Doors for your company. Whether you need a garage door for your local Fire Department or rolling steel doors for your distribution company, we help businesses throughout Middle Tennessee with garage door repair and replacement.